I’m not a builder, but since 1021 was built initially as a rental apartment, Odyssey was built more solidly. Also the upgrades are all a level nicer from flooring to appliances. I don’t know if the building has an official “Green” status, but the sellers we have helped have shown us their utility bills and they were as low as $35 a month total. About ½ of 1021. Sorry if this post doesn’t add new information. I’m just telling you what I know and not Bsing what I don’t. This is where 1021 skyrockets back on top. 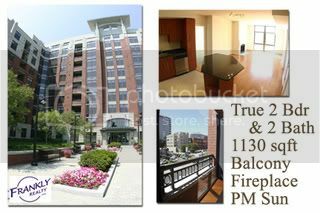 1021 is located in the more expensive Clarendon vs Courthouse. It is just 2 blocks from wholefoods, shops, restaurants, and night life. Meanwhile people that I know in Courthouse (1 metro to stop away) head to Clarendon 80% of the time. But not so fast, the nextdoor Dr Dremos and Taco Bell are being replaced with a retail area similar to Clarendon. They are both about the same distance to their respective metro, with courthouse being one stop closer to DC, but also one stop more full of people. The best thing to do when in these buildings is to talk to the neighbors. Recently I was working with a client and my 1021 bias was apparent so I thought I’d strike up a conversation with a resident. He went off on 1021 and how much he loved the Odyssey. On top of that, the 2 br run about $30-40K less for a similar sized 2 bedroom on a similar floor level. For him it was a no brainer, The Odyssey won him over. When showing places I try to keep my opinions to myself. It doesn’t matter if I like brown or rooms that can hold a projection TV. Or a condo that is 20% larger. Who am I to say how much room you need to live or how much you might not mind walking a few extra blocks. Bottom line is the Odyssey is worth looking at. Here is a link to Odyssey Condos for sale today. Here are 40 photos from 3 units we sold here. Do watch out since some units are wildly overpriced there. As in over $100,000 overpriced. Also email me if you want to see a spreadsheet that my agent Megan (our agent) did. She analyzed 30 past sales and it runs a ratio of the average profit and loss by the initial purchases (don't just go by the tax records, the seller subsidy matters!). What is one thing condos in both of these buildings have in common? If you are buying a condo that was built in 2004-2006, you can get a very good deal. If you bought your condo new in that time frame, sorry! Station Square was built in the same period and all 3 have both pros and cons, but living on the Orange Line is worth some irritations. 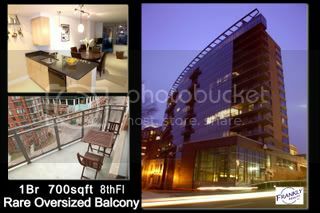 I like the Residences at Liberty Center a lot, great roof top pool and gym, good floorplans, right between Ballston and VA Square, near the library and the Giant, as well as pubs and stuff. Lexington Square is still a great investment/home as well.